raisin (GB) Your browser does not support any audio element. raisin sec (F) Your browser does not support any audio element. uva passa (I) Your browser does not support any audio element. Name for extremely dried grapes, which derives from the Old French term "roisin" (grape berry). They are divided into Zibeben (large berries with seeds and thick peel), currants (small, dark, seedless Berries) and sultanas (light, seedless berries). The names also result from the grape varieties often used korinthiaki. Muscat d'Alexandrie (Cibebe) and Sultana, Raisins are among the oldest preserved foods in humans. Especially during campaigns, raisins from many Arab and Asian peoples were often used as nutritious and long-lasting food for the soldiers. The general Hannibal (247-183 BC) from Carthage is said to have mainly supplied his troops with his train to Rome over the Alps his troops. Writings found in Egypt already document the production of raisins for at least 3,000 BC and also in the Bible they are mentioned more often. After harvest, the grapes are laid outdoors on wooden racks or cement or clay plates. After about two weeks they are turned. Some of them are also dipped in suitable solutions (vegetable oil and potash) in order to accelerate drying. In antiquity, a mixture of wood ash and olive oil was in use. In Australia and California, a special technique is used in which the grapes are cut at the base, hanging on the stick and sprayed with a dry emulsion. 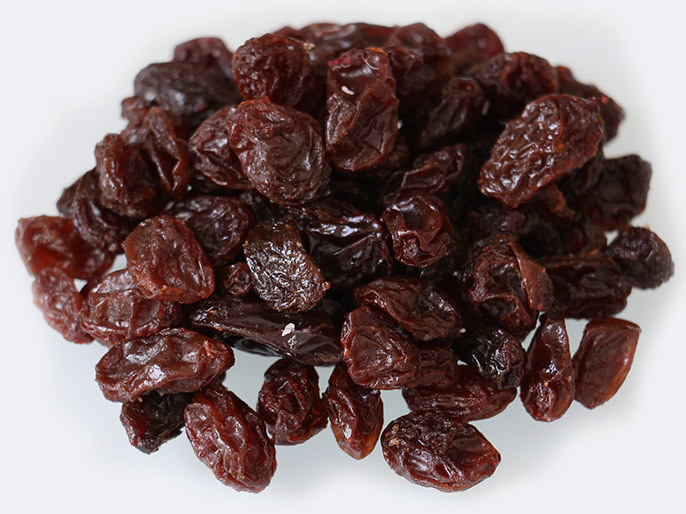 High quality raisins have a maximum of 13% moisture, a uniform color (from golden brown to purplish brown) and size and must be completely free from soiling. This page was last modified at 20 November 2017 at 13:01.